Not a party hostel but the staff is lovely and if you want to meet people there are tons of hostels around that make it easy. And was very clean which was a blessing! If you’re after a quiet hostel, then this is the one! It’s out of the way of the craziness that is phi phi. A little further walk that I would or preferred but, to get away from the main bars then that would have to be the case. The staff were helpful, and because I was waiting around, they let me check in earlier. Only thing is, the toilets aren’t in the room but, they are clean enough. I really liked the incense they burnt in the hostel - nice little touch. The room was really clean and modern. It is dark in the morning and you can have the air con on whenever you're in. The WiFi is ok. The door is heavy and loud so can be disruptive at night. Toilet and showers could be a bit cleaner and there's only four. The place lacks atmosphere as the common area is underused, it could have fans and more furniture to encourage people to socialise. Great location, close to beach. 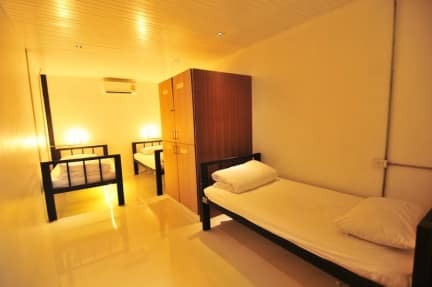 Overall, clean, quiet and meets all the requirements for a comfortable stay. Great place, rooms very peaceful and secluded. Feels like being sealed in a box away from the outside world. No windows. Cool for me, but maybe not for everyone. Staff very helpful the two times I got locked out. Neighborhood around the hostel not the cleanest though. I love this hostel because you can get some sleep at night and sleep in really late because it is so dark in the rooms. You can go party on the other side of the island and walk back to a great place to sleep to get a good nights rest. Staff very helpful and welcoming, rooms are great, internet and air conditioner works well. There is a nice and big common area what is great but isn’t very comfortable, it is such a waste as the area is very airy and large. Toilets are ok. The toilets and the shower weren’t clean and the stuff was unfriendly. For one night this hostel was okay but if you want to stay longer I would suggest to search for another accommodation.